The traffic regulations of this country state that the background of a plate should be black and the letters and figures white. Motorists, however, have the choice of using a front plate with a white (luminous) background, and black letters and figures. If this colour is chosen, the law also states the rear plate background must be yellow (luminous), and the letters and figures black. Inspector Kenneth John, second in command at the Traffic Department, told SEARCHLIGHT there is a problem which the police is trying to address. He said some persons have been decorating the registration plates with fancy letters and numbers, including italic letters and letters that are different than what was registered. âThe problem this creates is that people have difficulty recognizing the registration numbers of vehicles, especially those in hit and run accidents,â said Inspector John, adding that some vehicles have letters bordered with silver. âThose are offences under our regulation,â said John, explaining that the police started clamping down on this illegal activity in November 2008, and have stepped up their efforts since the New Year started. John touched on another issue that the traffic cops are trying to rectify. He said the Traffic Department has been receiving complaints from commuters about little boys working as conductors on motor omnibuses. 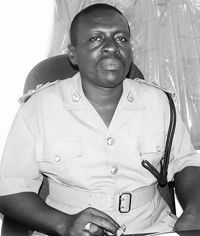 John, who was promoted to the rank of Inspector on September 1, 2008, outlined that the law requires every motor omnibus to carry a licensed conductor, 17 years and older, physically and mentally fit and of good character. He warned that no person must act as a conductor of a motor omnibus unless he is the holder of a permit authorizing him for the purpose. In the event that the motor omnibus does not have a licensed conductor, John cautioned that vehicle must not be used to carry passengers. Meanwhile, Henry Providence, who was recently promoted to the rank of Corporal, is encouraging Vincentian families with more than one vehicle travelling in the same direction to car pool rather than use all the vehicles. He is optimistic that this would reduce the vehicles on the road and ease the congestion in Kingstown. According to Corporal Providence, the traffic cops also have to deal with the problem of motor vehicles that are equipped with headlamps other than what is allowed. He said that section 21:10 of the traffic regulation states that motorists should not use vehicles at night with any lighted lamps other than the two head lamps and side lights and the rays must be uncoloured. He explained that there are exceptions with the approval of the Licensing Authority (Commissioner of Police). âMost of the vehicles are coming into the country with these lights (extra lights that are sometimes very bright and coloured) but they have an independent switch. We are asking people to refrain from using these lamps because if they are caught they will be prosecuted for sure,â said Corporal Providence. Traffic police have stepped up their patrols in Kingstown and have been extending the initiative to the rural areas.